Hot off the success of their 3in1 Exhibition at Bigtime Gallery in Drake, Revolutionary members, Clare Urquhart, Cassandra Purdon and Deborah Gower are bringing an updated version of their show to a wider audience via NEXT Gallery in Lismore in November. 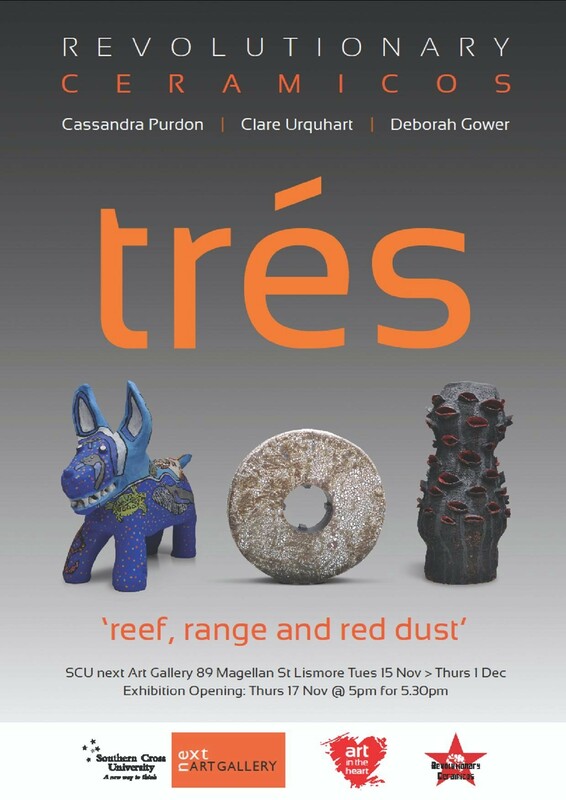 With an Australian theme running through all three Artists work, this new exhibition showcases their individual translations into ceramics of Reef, Range and Red Dust. Clare Urquhart, Cassandra Purdon and Deborah Gower are in the final year of their Advance Diploma of Ceramics, Lismore TAFE. Deborah Gower’s impressive Banksias are a tribute to Queensland painter Ellis Rowan. Deborah was granted special permission to look through the archives of the Qld Museum to gain inspiration for her work which serves as a reminder to us all to do what we can to save our unique native flora and fauna. Cassandra Purdon and Clare Urquhart both interpret recent travel experiences in their own distinctive way, both women spent time working with the World Famous Hermannsburg Potters earlier in the year, and these influences can be seen in their work. Clare captures the essence of Australia’s outback experience through her 3D abstract wall works. While Cass uses Dogs to tell her stories as a metaphor for the human condition and how we are trapped by conventions and stereotypes, she is increasingly concerned about the way we are continually losing our freedoms in today’s society. You three are certainly getting your work out there! Hope it goes well!